First stop was Toppings Bookshop to collect the tickets; a proper bookshop, a bookshop stuffed with Wonderful Things and smiley friendly staff, as all proper bookshops should be. 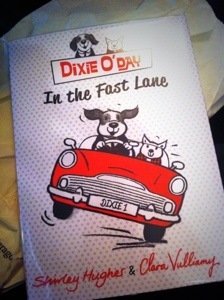 Whilst browsing in the children’s section, a familiar cover caught my eye, and I had to buy it – look, it’s the Dixie O’Day book, written by Shirley Hughes and illustrated by Clara Vulliamy! If you don’t follow Clara in Twitter, please go there right now and do so. She’s a fab illustrator and a very jolly tweeter! The queuing had commenced… This was about half past four, so we decided we’d have just enough time to grab a quick pint and some food before joining in, which we duly did. We headed back to the cathedral about an hour later, and the queue now stretched along the front of the grounds and round the corner, about half way down the path. Gaimanites were sitting on the grass in the sun reading (mostly copies of Ocean), or standing around chatting, or twiddling with their phones. We joined the queue and did the same, although I read Dixie O’Day (which is great! ), stopping occasionally to gently flick tiny spiders off my satchel. Tiny spiders I can deal with – it’s the big ones that make my head implode. 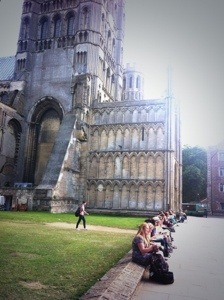 Quite Interesting Fact about that photo of the queue – see that turret in the background? That’s the south west transept, that is. And see that slopey bit in the foreground? That used to be the north west transept, until it fell down in the 15th century. I know that ‘cos after I’d finished reading Dixie O’Day in the queue, I found this excellent article online all about the cathedral – worth a look if you like your history. Then – oooh! – the queue (which by now had stretched out into infinity and possibly beyond) started moving forward, and suddenly we were in the cathedral, and I was trying not to trip over as I couldn’t help looking everywhere except where I was going – it’s such a beautiful work of art. 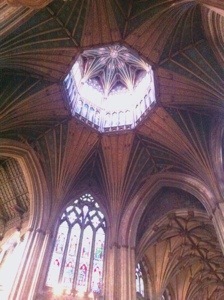 So massive yet delicate, so grey, but then so surprisingly colourful with painted woodwork and bright stained glass. Yum. Oh, there were wee cups of wine for one and all as we went in, so double yum. 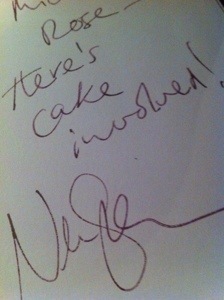 We were also issued with a little raffle ticket for the signing afterwards – mine was number 195. That doesn’t do the colours justice – the wordwork is richly decorated in reds, greens, golds and blues. It’s absolutely stunning. And (as nearly-promised by Toppings Bookshop in their email) as I gazed up at it, an occasional bat flitted across. I’m not sure what the difference is between your standard bat and an occasional bat. Actually, I rather like the idea of Occasional Bats. Maybe they’re not bats all the time… hmmmm… Anyway, I hoped they wouldn’t poo on him* while he spoke. The whole cathedral was all very Unseen-University-esque, and I wouldn’t have been at all surprised to hear a faint ‘ook‘ echoing around, or for a peanut shell to drift lazily down from on high. And while I was mulling over those thoughts, a door just to the right of me opened and Mr Gaiman himself came out and disappeared into another room behind us. Except I missed that, because at that exact moment, as well as mulling, I was checking his Twitter feed on my phone, and going “Awwwww!” in my head because he’d just sent some flowers to his wife (the equally Amazing and Incredible Amanda Palmer), who was poorly. Then he was standing right next to us whilst a nice lady introduced him most delightfully, and (after realising at the last second that he’d forgotten his clip-on microphone, which I thought was a nicely normal thing to do) he took the stage. Or the podium. Or the bit at the front of us all under The Octagon, where the golden-eagle-of-a-lecturn lurked behind him. And he spoke. He spoke of how his latest book, The Ocean at the End of the Lane, was born, then he read from it. I’ve seen the odd clip online of him reading from his books, but no video clip in the world really prepares you for actually hearing him read In Real Life. It’s sort of like the completion of a massive circle of wonder… Those words that you’ve read, that came out of his head, that he built into sentences so craftily and perfectly, that read like you’re hearing them – well, suddenly you are hearing them, in his voice, right there in front of you, and they sound just like they sounded in your head when you read them. I’m a huge believer in reading out loud what you write – it’s only then that you find out if things work or not, if they sound right, if they sound real (even if the subject matter couldn’t possibly be real). The three living writers that achieve this art perfectly (in my humble opinion) are Neil Gaiman, John Irving, and Sir Terry Pratchett. That’s not to say that all the other wonderful writers who’s work I’ve read (and haven’t read) don’t achieve this – I think probably everyone’s internal ears (I know what I mean!) are different. I just mean that for me, the words of these three have something extra-special that gets right into my head and speaks to me. I’ve already read The Ocean at the End of the Lane – I bought a copy from Bookends in Carlisle (another proper bookshop) in July when I had an overnight stop there for work. It’s so good that it left me feeling as if I had just witnessed something incredible. As if I’d discovered a book that would be looked back on by future generations as one of – or The – absolute all-time best book ever written. It was so familiar, I felt as if it had all happened to me. I’d had one of those ladybird magnets! I remembered those feelings, those childish thoughts! I’d had an ocean at the end of my lane! Well maybe not, but do you know what I mean? Perhaps those of you that have read it will do. There were also many, many bits that made me stop. And re-read, and re-read, and re-read again, just because of the beautiful, complex, simplicity of the writing. There’s one particular bit that for some reason just floored me, and after reading it again and again I had to just sit staring into space for a while to get my breath back. If you have the hardback, turn to page 120. Read from ‘I found a kitten,’ and stop when you’ve read ‘…If you listen.’. I have no idea why that innocent little exchange of dialogue blew my mind so much, but it did. It’s the best book I’ve ever read. So please read it. Remember that?! It was brilliant! It loved it so much that I’d often play it by myself. You span the little metal spinney thing, and it landed on a letter. Then you picked a card, read out the question, and the first person to give an answer beginning with that letter won the card. And the reason I loved that game so much was because for a lot of the questions you could make the answers up – then make up stories in your head around your answers. Although that always worked better when you played it on your own. ‘What frightens you?’ was one of my favourite questions…. Melting eyes, a lisp, reading poetry and prose aloud when you were little, fatbergs… He spoke, we listened, chuckled, and the cathedral loomed around us as the light faded outside, dimming the stained glass and turning the colours in the roof to shades of grey. 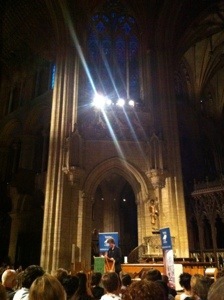 Then the cathedral was lit up by the stunning shinyness of the cover of his new book for children, ‘Fortunately, the milk…‘, and he treated us to a reading from it, which was a bit cruel as it isn’t due out over here until September and I want to read it now. Our belly laughs echoed around the cathedral, and I’m pretty sure that the golden-lecturn-eagle cracked a smile at one point. Oh dear, this is turning out very long, sorry. But we’re nearly there, so stay with me. Neil then took a break, whilst all 1000-or-so of us were organised into groups and given queue times. We were in the first 200, so only had about an hour and a half of waiting – we were out by 10.30pm. Do the math… I heard it was around 2am when he finally finished. You see, he signs and has time for everyone, although apparently this is the last tour he’ll be doing this – my guess is that the muscles in his writing hand must have developed to such an extent that if he doesn’t stop doing it soon, he’ll have to start having all his shirts and jackets specially made with one extra-wide sleeve so he can get his magic-writey-hand in. He sat before the grand altar, and we filed up past the ornate organ (snigger), me getting more and more nervous, changing my mind about the dedication I wanted him to write, then feeling a little disappointed when we were told that it would be names only, then panicking about whether I’d made the right decision to have my Special Thing personalised and not his book… and the nearer to the front we got, the smaller and younger I got until I was about seven years old and processing up the choir in the tiny village church to sing a solo which never happened because I was so nervous I fainted and was sick all over my choir robe and I came round in the vestry and the vicar was giving me little sips of holy water to revive me because that’s the only water there was and it tasted sweet as if it had sugar dissolved in it. Thankfully, I didn’t faint, I wasn’t wearing a choir robe, and I wasn’t sick on it. Instead I just went all shy, managed to say ‘Lo,’ in a tiny voice, watch mesmerised as he wrote my name (AND the extra little thing I’d written in my post-it note that the lady had missed and didn’t cross out) with his magic-writey-hand that he writes stuff with, in purple ink, with a proper ink pen, filled from the little bottle of purple ink on the table in front of him. Then I just about managed to squeak ‘Q,’ – and ran away. What happened?! Must have been The Author Effect – it was practically a repeat of what happened when I met John Irving! I wanted to thank him for writing the best book in the world, and for writing all those other amazing books, and… and.. and… oh, I just wanted to SAY stuff! But instead I went all shy, then ran away. Well, walked away in a daze. But in my head I was seven years old and running, sandals slapping on the flagstones of the cathedral floor, running to find my mum and dad who’d be waiting for me at the back, waving my signed goodies to show them proudly, with tears of awe and joy running down my cheeks and (probably) a snotty nose. The Special Thing I eventually plumped for is my latest writing journal. I filled up the last one a few days ago, so bought a new one. Yesterday it had about four pages of the next two Granny Battle chapters in it (in black ink), but nothing yet of my Shed stories (which would be in green ink, if there was anything there). Sam struggled to get his arms free and waved them wildly. ‘But where’s it gone? When will it be back? It never disappears at home! How do I get home if it doesn’t come back? I haven’t got any money! Or a passport! And tea’s at six! There’s cake!’ he howled, struggling to squeeze out of Arthur’s trunk. Arthur looked shocked. He put Sam down and flapped his ears. ‘Cake?’ he asked, ‘Oh dear. Oh no. Oh dear. Ohdearohdearohdear.’ He looked at George, who was picking his teeth with a claw and obviously hadn’t been listening. ‘George?’ called Arthur, ‘George! There’s cake!’ George pricked up his ears and looked round. The Shed stories are back in action. There is green ink in my journal. *The bats didn’t poo on him. At least, not that I saw. I’ve been having a right barney with myself about the difference between being influenced and being inspired. I’ve been mulling over this off and on for a few days now. Just because I like a certain author, does that mean they’ve influenced me? Have they in some way had an effect on the way I write? Shaped my thought process when I’m writing? Do I write because I’ve read them? They may have inspired me to write, or to want to write, but I don’t think they’ve influenced how I write. Or why I write. And hang on, does the who even need to be a writer? I write because there’s stuff in my head that needs to come out. There’s always been stuff in my head, and I’ve always written it down to get it out, even when I was a little wee thing and was only beginning to master the black art of Putting Letters Together To Make Words. I just hadn’t always thought that the stuff was worth sharing with anyone. How it comes out – how it ends up sounding when it’s read – is my voice. Is my voice a copy of a favourite author? Or an amalgamation of lots of favourite authors? I’m reminded of a conversation between two authors at The Lowdham Book Festival recently about how long it takes to get into reading a novel – how long it takes before you decide it’s any good, and whether you’ll carry on reading it or give up. About 50 pages seemed to be the general opinion. I can’t give up. Even if a book or story is really bad, I have to finish it. I can’t tell you why – though maybe it’s a need to know what happens next, no matter how badly written it is, or how poor the story line or plot is. I don’t see it as a waste of time to read something you’re not enjoying. Actually, I’ve just had a thought – maybe that has something to do with being force fed those classics at school; being fed little chunks, skipping about from chapter to chapter in the wrong order, analysing the characters and dissecting the plot before we even knew the story… and hating the process and hating the books and hating the authors and hating the teacher for making me hate the books, because I loved books and loved reading. I remember once getting told off by an English Literature teacher because I read a new book we were given from cover to cover before we started studying it. WHY?! Years later I read those same hated school books and plays for pleasure – and discovered their greatness. Perhaps that has something to do with why I now have to finish reading everything I pick up… just in case there’s some greatness I might miss if I don’t finish it? Which brings me back to the word influence. (Or does it? How?! Oh well, I’m going back to it anyway.) Other writers may have influenced my behaviour sometimes by making me want to drop everything and get on with my writing. But it doesn’t have to be a good writer, a writer I admire and whose work I love, that influences my behaviour in that way. It could be that I’ve just read something I thought was crap, or that I didn’t fully understand. Or on the other hand, it could be something that I thought was truly wonderful, that blew my mind, knocked me sideways with its brilliance and left me glowing and breathless. 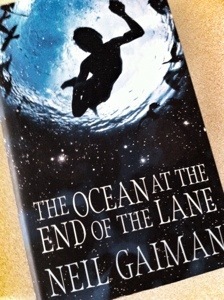 Neil Gaiman’s ‘The Ocean at the End of the Lane’ just did that to me – but it didn’t make me think ‘Ooooh, I want to write just like Neil!’ or ‘I’ll never be that good a writer so I might as well give up.’ It made me happy to read it. It made me feel good. 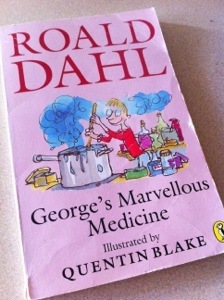 It made me feel like a child again – and that feeling is I think perhaps key to some writers. The feeling that you’ve never quite grown up properly; the feeling that in your head you’re still running around going ‘Wow!’ and ‘Why?’ at everything – from the mundane to the bizarre, the joyous to the saddest or most painful. You see a leaf blow across the pavement, and you want to chase it. You wonder where it came from, how long it’s been travelling. Did it leave its home by choice, or was it blown away by the worst ever storm ever? Or is it just popping out to visit friends? Maybe it’s going on an adventure? If it could speak, what would it sound like? Does it have friends? Are they leaves too? Maybe its best friend is a conker? Now I want to write a little story about a leaf and a conker. Did I influence or inspire myself? Where did those thoughts come from?! Who put them in my head? Was it you? Does that story already exist? Am I just remembering something I read? My conclusion is that a writer is influenced by a big tangled messy conglomoration in their head of everything they have seen, heard, read, felt, and experienced since the day they popped out into the world. Even the bad stuff. And that sometimes things happen that trigger weird reactions in that big tangled messy ball, which starts fizzing and popping – sparks fly, strange bits link up which hadn’t linked up before, bells and buzzers go off, sparkly coloured lights flash, a honky thing honks… And that’s inspiration.